William Anderson says it took more than willpower to lose 140 pounds and keep it off for over 30 years. Here’s his advice on how to change your long-term eating habits. Bill Anderson, creator of the "Anderson Model for Permanent Weight Loss", before and after his 140-pound weight loss. 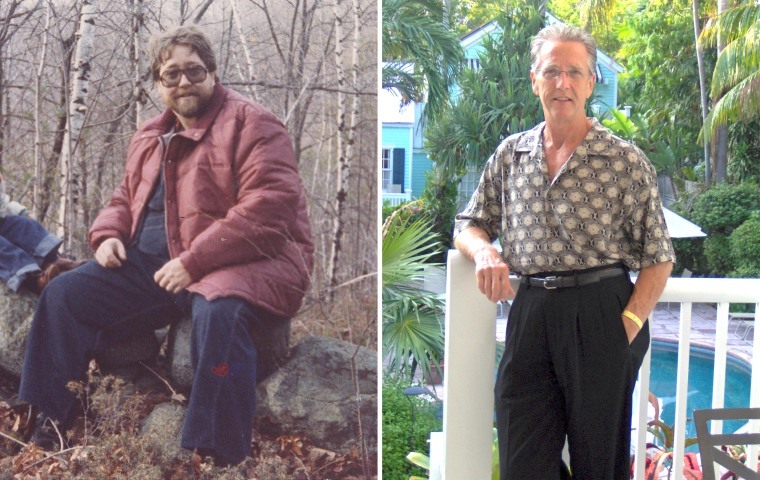 In the mid-1980s, William Anderson lost 140 pounds in 18 months. The psychotherapist has kept the weight off ever since, but still eats whatever he wants, and looks forward to Thanksgiving. “I’m going to have turkey and dressing and gravy and pumpkin pie, and all of those things, but it will be in the portions that I have become habituated to,” Anderson tells NBC News BETTER. Anderson, who authored the popular weight loss book “The Anderson Method,” says he was obese from childhood until his mid-30s. He says finally losing weight after many years of struggle took more than willpower. Here’s his advice on how to change long-term eating habits. Most people only count calories when they are dieting, then go back to eating “normal,” says Anderson. But he says this way of thinking is backwards. If you are going to lose weight and keep it off, Anderson says, you need to count the number of calories you currently eat. Knowing how many calories you currently consider “normal” will deter you from falling back on old habits, he explains. All too often, people who want to lose weight are hyper fixated on reaching a certain number on the scale, according to the author. If that’s your goal, he says, you will likely change your eating habits and exercise routines until you achieve that number, then go back to your old ways. Anderson says there are no fancy gimmicks to keeping a healthy weight: all you have to understand is the amount of calories you need to maintain it and stay in that range. It’s also important to be realistic, he says. If you enjoy a mostly sedentary lifestyle, how much you eat needs to reflect that. “We need to look at what is the metabolic rate that I will have for the rest of my life for the way I want to live,” Anderson explains. You can use this simple online calculator to understand how many calories you need to eat given your regular activity levels. A recent study finds that people who maintain a low-carb diet after weight loss are likely to stay slim. While healthy eating is important, the behavioral therapist says it’s important to still enjoy foods you crave. His first rule of thumb is to eat what you enjoy, but in smaller portions. “I’ve learned to eat what I like in the portions that keep me from gaining weight, and I enjoy it more than the eating I used to do when I was overweight,” he says. This “eat-what-you-like” rule goes against most conventional wisdom, he says, because people often believe they can give up certain foods for a stretch and then go back to their “normal” eating habits. “This idea that I’m going to do something that I hate to lose this weight creates an aversion to doing it,” Anderson explains. Instead, he explains, you need to reduce the amount you eat while still eating what you like. The number-one strategy Anderson employs to maintain a healthy weight is meal timing. He says he only eats at specific times during the day and fasts between meals. RELATED: See how this woman lost 65 lbs through intermittent fasting. On weekends, Anderson allows himself to eat more, but maintains a balanced caloric intake throughout the week. “It’s not a matter of just going crazy on the weekend,” he warns. Losing 140 lbs and keeping it off has been life changing for the 69-year-old. “To be able to solve that problem and feel good about myself and about my future, I mean, it’s just the best thing that’s ever happened in my life,” Anderson says.